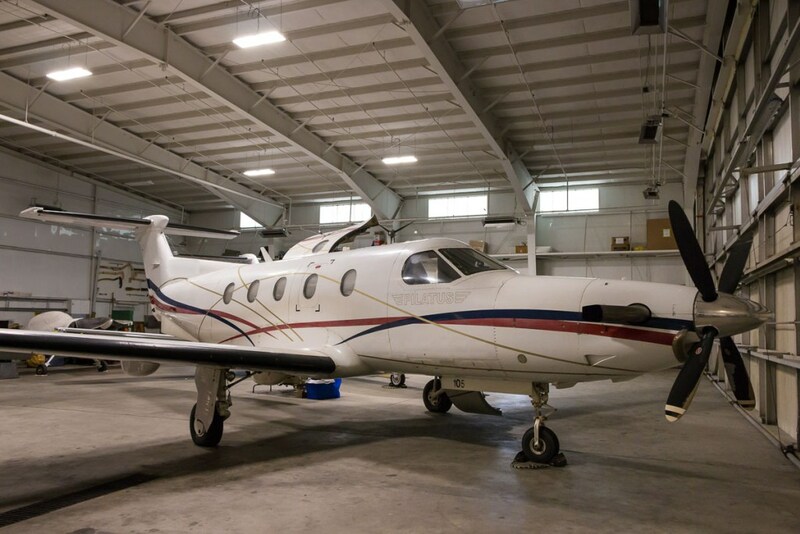 As the premiere certified Pilatus Satellite Service Center in the northeast U.S., Northeast Air has the privilege of performing maintenance and repair on some of the finest business class aircraft in the world. 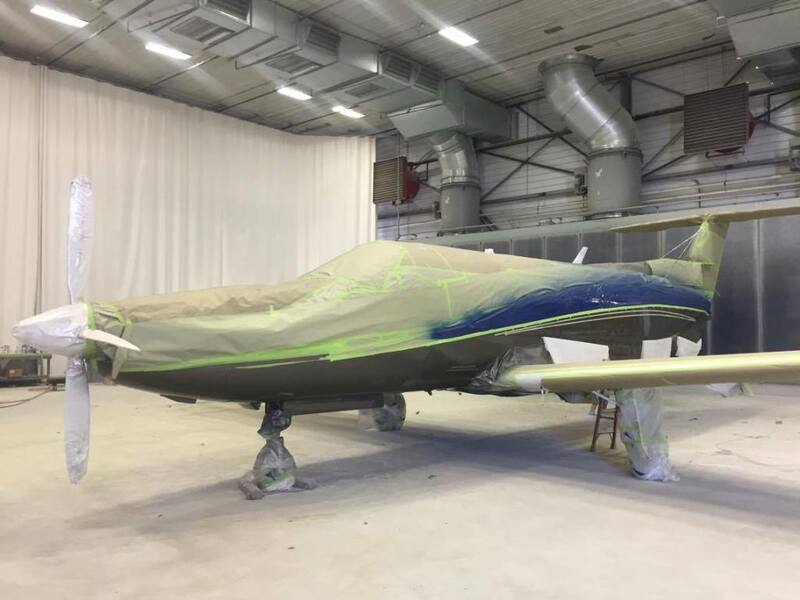 This past winter, we had the pleasure of working on a unique aircraft. A Pilatus PC-12 came to us after a whirlwind flight from the east African country of Uganda for a complete repair and inspection. But the story doesn’t stop there. It began last December, when the aircraft arrived at our facility after a grueling flight through more than 5 countries, 3 continents, and many, many flight hours. Moments after landing, the plane taxied on to the Northeast Air ramp and was towed into our maintenance hangar. 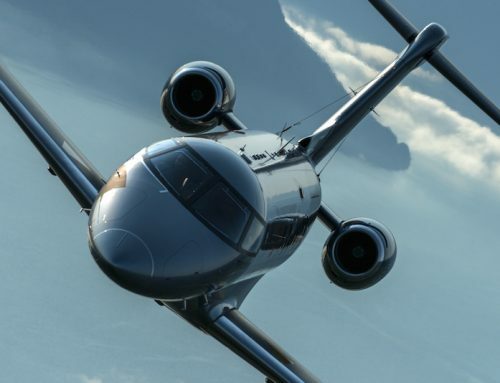 There, it began a five month overhaul, both here at Northeast Air and at our friends at C&L Aerospace, that would leave this workhorse looking like a brand new aircraft. Work started almost immediately the next day on the PC-12, an aircraft which was being overhauled so that it could be put back on the market for some lucky new owner. NEA Maintenance Technicians began with a 10,000 hour/11 year wing off inspection, one of the few facilities in the northeast qualified and ready to perform such a procedure. With care and precision, fairings were removed, pins were pulled out, and 4 techs began to slowly slide the wings off the side of the plane. 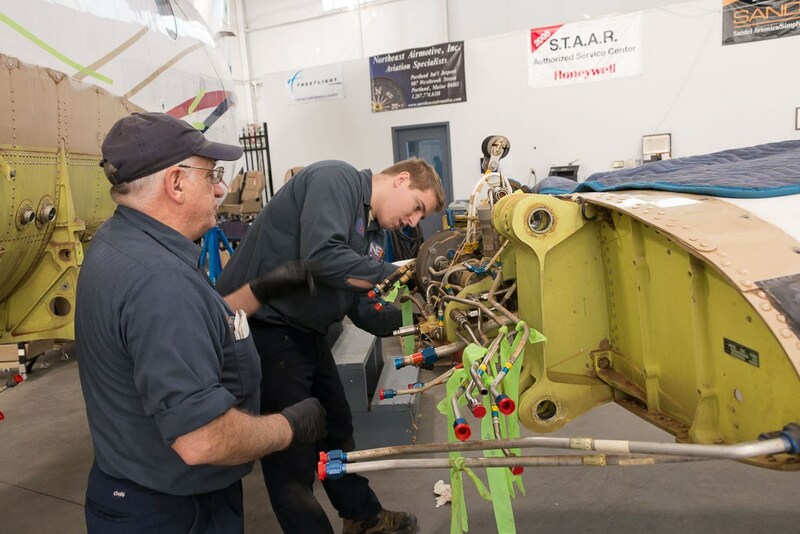 With the wings out of the way, our techs were able to inspect the entire connection between the wing fittings and the fuselage, a crucial element to the performance and safety of the aircraft. Next, techs performed internal and external inspections, looking for any signs of corrosion and wear on all parts of the aircraft. Just like a car, corrosion can damage important parts of an aircraft that can impede its proper and safe operation. Our technicians go through the entire aircraft looking for and noting corrosion, and making arrangements for cleaning or repairing of affected parts. All aircraft get an annual inspection, so that was performed as well. In conjunction with Pro Star Aviaton, our Avionics department also stepped in to do an upgrade of the PC-12’s avionics. Work included removing the old avionics system, wiring and harnessing new cabling, and installing parts of a new Garmin avionics system. One of the more unique parts of this install was that our Maintenance department created a custom instrument panel faceplate for the aircraft to fit the new Garmin avionics system. Northeast Air Maintenance Technician Jason Castillo fabricated the faceplate in-house from aluminum stock according to tight specifications. 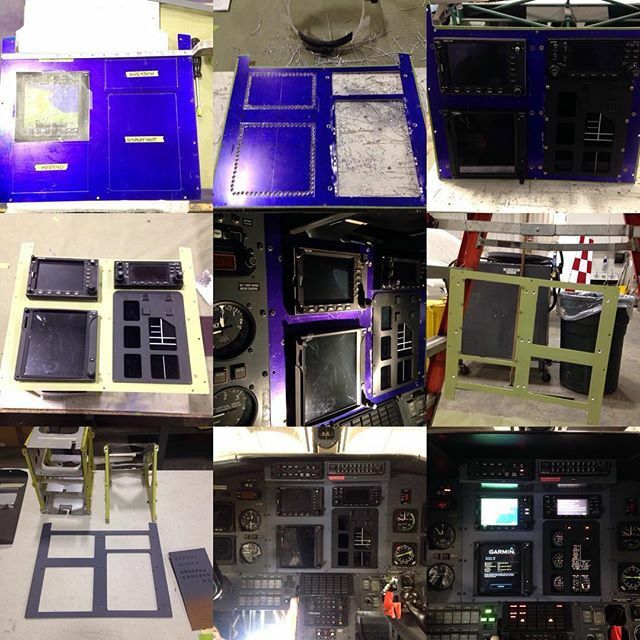 After finishing, prepping, priming, and painting, the faceplate was installed and the avionics tested. The final piece of the puzzle was to send the hot section of the Pratt and Whitney Canada PT6 turbine engine off to Dallas Airmotive for an overhaul. As the hot section was repaired, and with all inspections complete, NEA’s maintenance technicians began the painstaking process of putting everything back together. Once the turbo engine was put back on the aircraft, test flights began to ensure everything was in top notch working order. The flight from Uganda to the U.S., and the many years of service of this 1994 Pilatus PC-12 had done a number on both the paint job and the interior of the aircraft. It was time for some sprucing up. 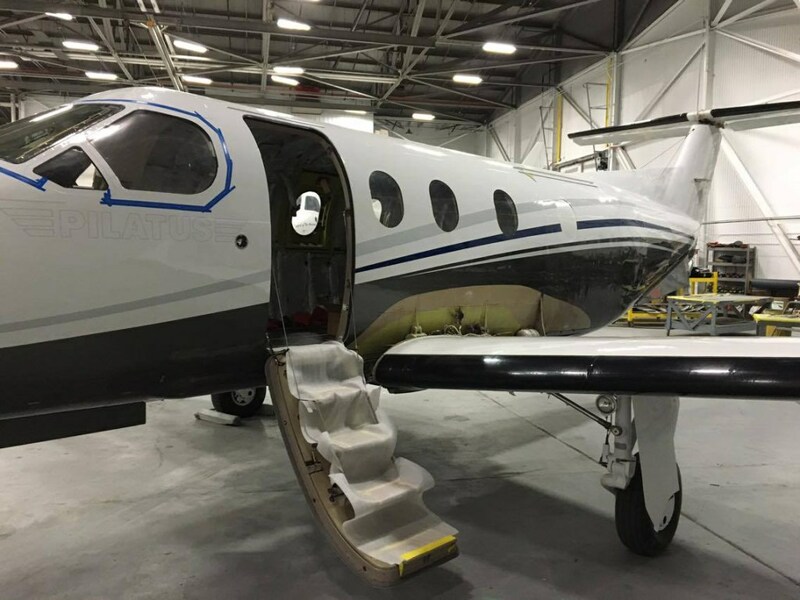 A Pilatus pilot flew the PC-12 up to Bangor, Maine, a short flight north of Portland. 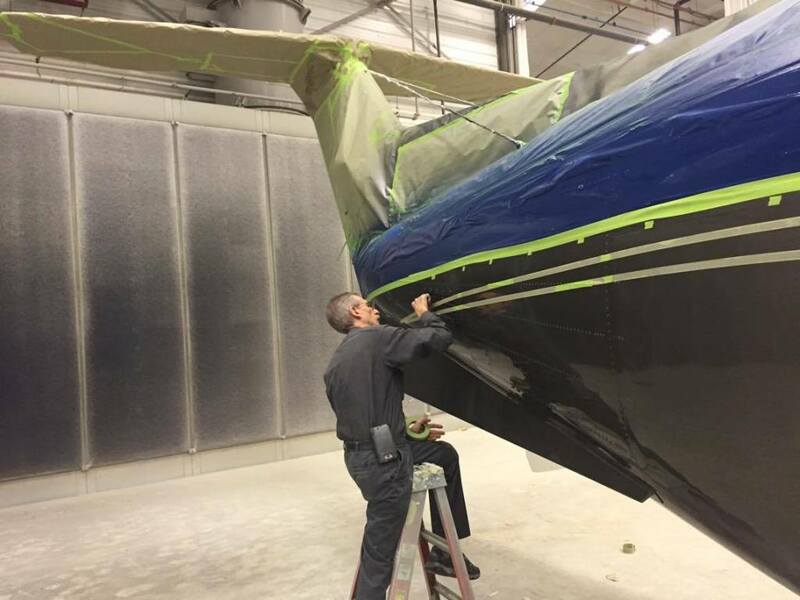 There, our friends at C&L Aerospace began the process of upgrading the look and feel of the aircraft. They began on the exterior, with a fresh coat of paint and new, more modern and sleek looking striping. Carefully covering the fuselage with plastic and masking tape, the skilled artists at C&L added deep blues and bright whites to the body, giving it a seemingly new life. 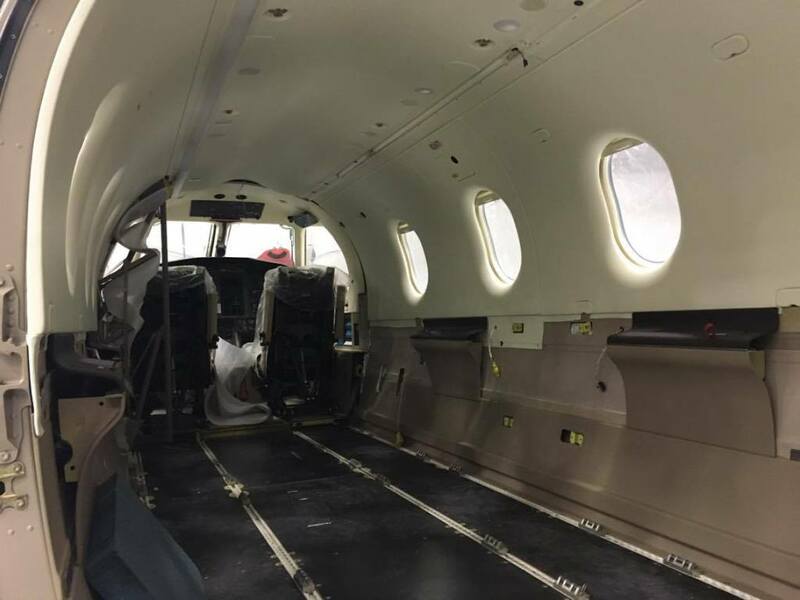 Finally, C&L techs stripped the aircraft’s interior of its old, well worn seating, carpeting, and other interior amenities, and started from scratch. 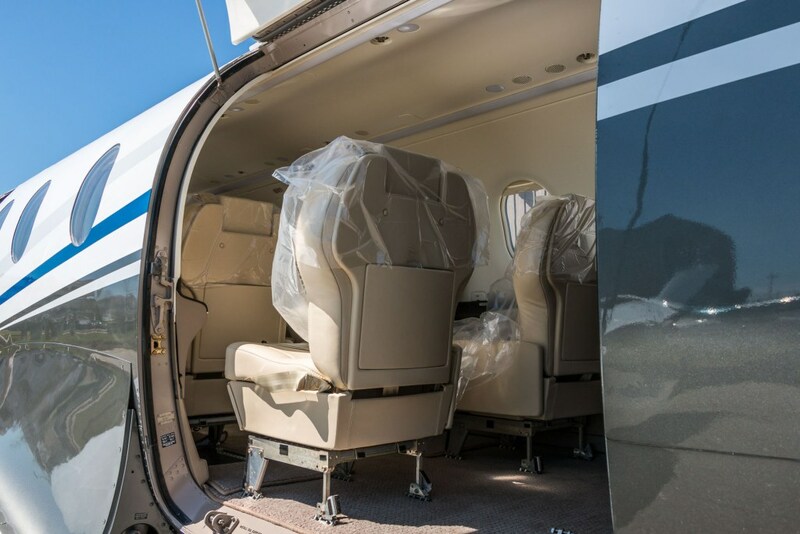 New, comfortable leather chairs, a brand new carpet, and new lighting were just a few of the interior upgrades made to the PC-12. 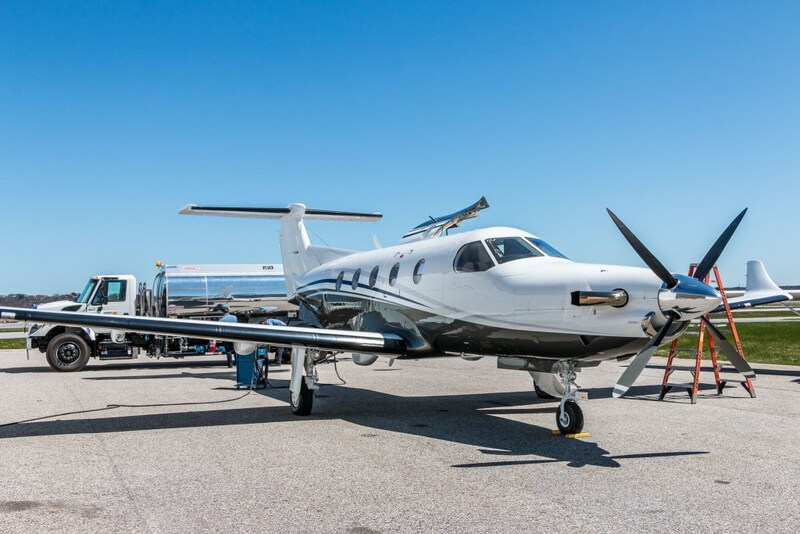 After more than five months of inspections, repairs, and upgrades, this Pilatus PC-12 that began its journey thousands of miles away from us in Maine started its new life. Looking beautiful with its new paint job and interior amenities, the PC-12 returned to Northeast air for some final tweaks and adjustments. Our avionics crew readjusted the avionics system, while the rest of the maintenance department went through the aircraft, meticulously inspecting every inch for problems. 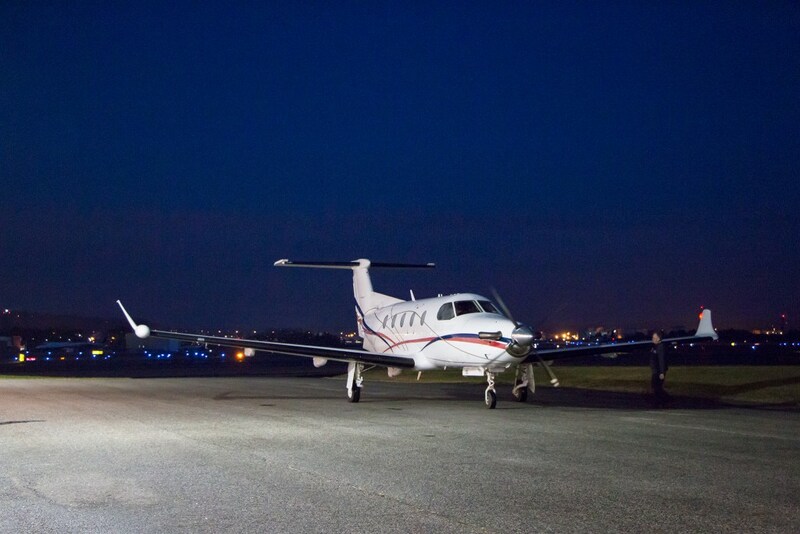 The PC-12 was given a clean bill of health and sent on its way. It’s been a fantastic experience working with this great aircraft, and we love showing off what we can do.